Last night we had fish for dinner with mashed potatoes and baby beetroot, fresh from the garden. With a few beets left over and about a coffee mug of left over mash (made with cream and butter, salt and pepper), it was time to mix a biga together for this morning. Ciabatta with purple dots of beet root. 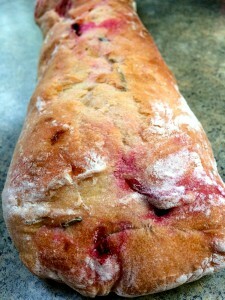 This "no knead" bread is just delicious and very simple. It's too hot to knead, frankly, and the heat of the summer enables the biga to develop quickly so just 10 hours of life gives it a lot of life and flavour. Add the mash and the diced beets in at the end, give it a little knead so you don't squash them all and then just stretch and fold to finish the dough off. The result is chewy, flavourful bread, delightfully dotted with bits of purple beet. Add the water to the bowl and then add the yeast. Wait for five minutes to let the yeast dissolve and then squish the biga/water mixture together with your hands to make a milky paste. Add the fresh flour and the salt. Stir it all together well. 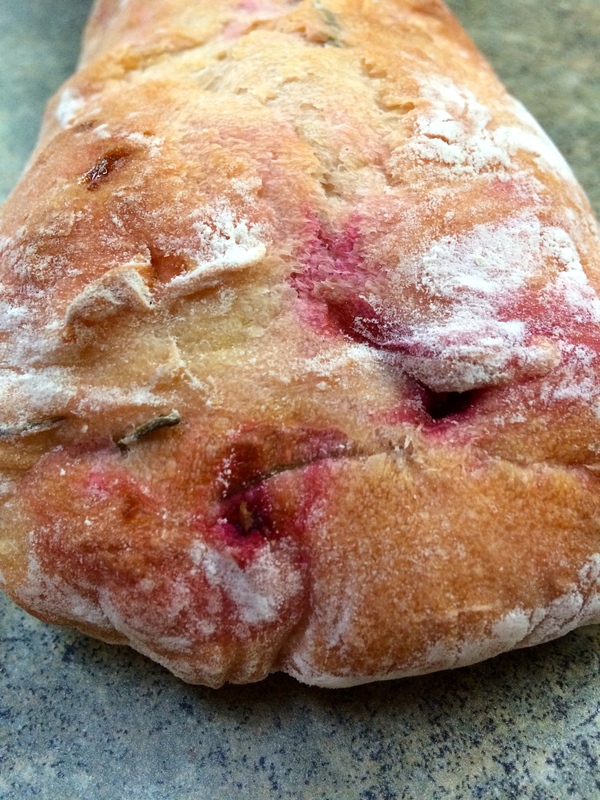 Add the potato and the rosemary and give it another stir/knead to make sure it's all incorporated evenly and then add the beets and give the dough another gentle stir/knead so you don't squash the beets to death. Cover the dough and leave it for 30 minutes. Lovely open crumb, beautiful to look and and amazing to eat! Stretch and fold the dough and then let it rest for 30 minutes. Repeat this four times. If you are not sure what it means to "stretch and fold" you can watch a little video here! Scrape the dough out onto a lightly floured surface and divide it into four equal pieces. Cover and let rest for 20 minutes. 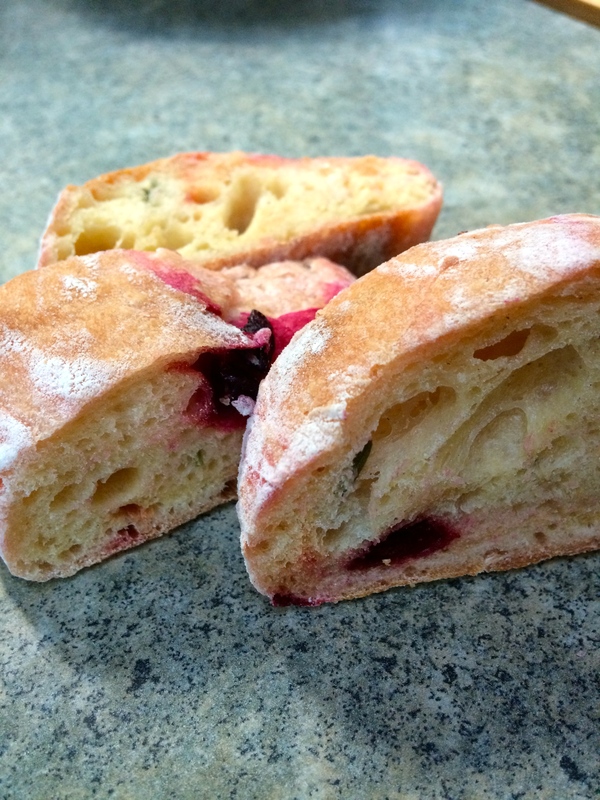 Shape the dough into a ciabatta shape. Cover and let rest for 30 minutes. Preheat the oven to 230 degrees C and pop the dough in. Bake for 20 minutes and then remove and let cool completely on a cooling rack. Devour. YUM! Come and learn to bake bread with us! 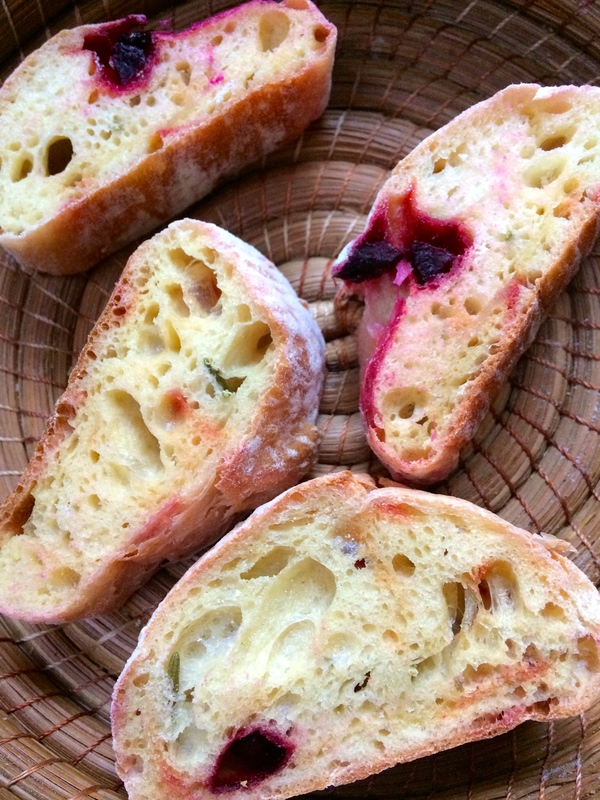 Click here to take a bread course - type "italian" into the search bar if you want to learn how to bake ciabatta! This looks delicious. I assume that other ingredients can be used to replace the beetroots or the mash potatoes right?